The connotation and form that fresco own is more onerous than the singles draw, the art problem that you need to consider is much more. Confront with the special function of building environment space, the effect is showed through the fresco, it not only depends on the function of specific environment and the demand of content, you should also consider and the coordination of environment, meanwhile, it is necessary to take the maneuverability of the process into consideration. Stone panel mural can adapt to the pressure of the mural art creation that it conveys, because of its natural guileless, which can adapt to all kinds of carrier and the environment; Its agile technique can shape various forms; It's long cultural of the connotation can show all kinds of style and the subject; Its mature technology has the maneuverability inion. 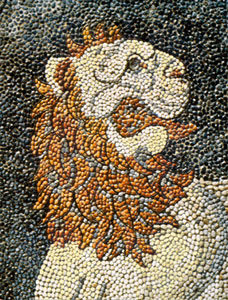 Stone Mosaic mural was breed, developing and prosperity in the period of ancient Greek, Roman and Byzantine. Especially in the period of Byzantine, stone panel murals in various religious architecture plays "picture the bible" the role of publicity doctrine. The theme, flat, symmetrical composition of bible story, the person sculpture without volume character, which has the symbolic adornment colour, it gives fully play to the art characteristics and advantages, and make it fuse with the church, it builds a - a blinding light, the world of the kingdom of heaven.